* SUPPORTS VALIDATION/PRODUCTION TEST PLANS. * SIMULTANEOUS BC, MULTIPLE RTS, MONITOR. * FULL ERROR DETECTION AND GENERATION. * ON BOARD MAJOR/MINOR FRAME TIMING. * SOFTWARE WITH SOURCE CODE INCLUDED. * 32 WORDS BI DIRECTIONAL PCI FIFO. * 128K x 16 DUAL PORT STATIC RAM. Type 32 Bits, 5 Volts, Target only. The CIC301 is a full-featured, high performance, Dual Redundant MIL-STD-1553A/B serial bus Simulator Analyzer Tester designed as a plug in card for PCI backplane. The CIC301 includes full error injection and can operate in indepen­dent or simultaneous mode as a Bus Controller, multiple simulated Remote Terminals and full/sele­ctive Monitor. Its data structure can be changed on the fly without interrupting the processor for real time operation. The active monitor stores, time tag and annotates bus traffic with the message type and any detected errors. Stored words are annotated with a break down of the word error. The CIC301 can be used for Validation Testing, Production Testing, full bus simulation and monitoring, as a general purpose 1553 interface or a stand alone bus Analyzer. For precise message scheduling and measurements, the Major and minor frame times are independent of message sequences or retransmissions on errors and the start of all command messages are independent of message length, response time or length of response. Message timing is calibrated and RT responses have low jitter. The CIC301 comes with software drivers for DOS and Windows 98/NT/2000/XP. A set of well-documented API’s with Source code written in "C" is included. A menu driven user interface is included for stand alone operation. With this program the user can set up 1553 traffic, simulate RT'S responses, monitor all or selected traffic in real time and capture data using trigger and search arguments. The CIC301 data filter looks at the complete command rather than just addresses and sub addresses. Individual Mes­sages are designated to be ignored, monitored, replied to or monitored and replied to. The CIC301 processes 1553 messages with a minimum attention from the CPU. The user need only write a set of command Blocks, a message list and number of messages to define a minor frame of 1553 messages. He writes a minor frame time, the number of minor frames per major frame and a minor frame list to define a major frame. 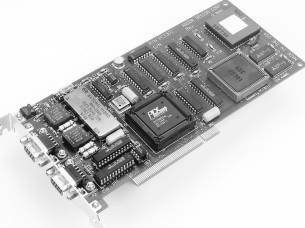 The bus controller sends the major frame a number of times as programmed in the major frame count, without any further attention from the CPU. In the Remote Terminal mode, the user writes a set of command Blocks and a look-up table for the CIC301 to respond autonomously to incoming messages. In both modes an active monitor analyzes, annotates and stores bus traffic in a monitor Buffer. The CIC301 generates ten interrupt flags to show completion of a frame in the BC mode, receipt of a specified message, receipt of a specified Data word, receipt of a specified Status word, detected message errors or triggers. The CIC301 operates as a 32 bits, target-only device with interrupt support. An auto indexing Dual ported, static RAM serves as the intermediate for data exchange between the on board PCI FIFO and the 1553 bus. An auto incrementing address register serves to hold the initial RAM Address and increments after each data transfer. Two additional registers control the mode of operation. Both the registers and the RAM can be loaded with new data while a message is being transmitted over the 1553 channel for real time applications. Essentially, programming the CIC301 consists of transferring data to or from the RAM and the host. Copyright (c) 1995 - 2007 by Andor Design Corp.